Create a WPtouch Pro child theme if you're not already running one. You can create one manually or via the Make Child Theme extension. Copy the code below to the very end of the header-bottom.php file that is in the child theme. Save the changes to header-bottom.php. Activate the child theme in the Themes area of the WPtouch Pro admin panel. 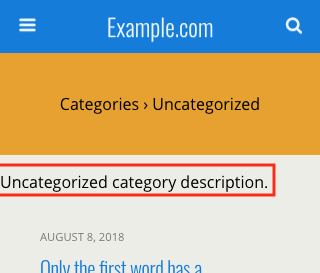 The category/tag description will appear in archive pages after the category/tag name. 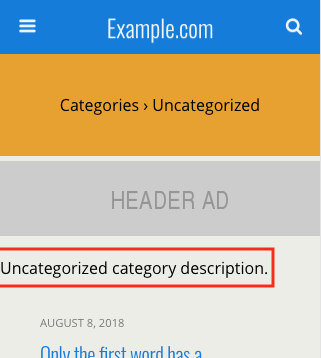 The category/tag description will appear in the archive pages after the header ad.